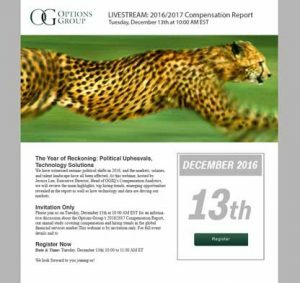 When Options Group asked us webcast the highlights of their 2016|2017 Compensation report to their staff and partners in two weeks, it helped that we already know the ample things to think about right away — the invites, the registration and all the other details that wouldn’t blind-side us this time. Production Manager Eric Wolfram shares these webcast deliverables so that they don’t blind-side you either. The Webcast Evite needs to have a single function — motivate people to register. These emails should be short and to-the-point. Information hierarchy is very important. Event details should always be up top, prominent in size. The call-to-action should be clearly-defined and easily discernible at a glance. Information secondary to the email’s main purpose (if it’s an invitation) should always come after event details and call-to-action. The copy on this page usually is similar to the invite, only there is more information. Typically a bio or two about the speakers, something about the company, and, importantly, the registration form. You will want to decide on what details you want to caption from each registrant. First Name. Last Name. Email Address. Beyond that, phone number, job title, company, industry are typical. Then you will want to determine which of these fields, if any, are required. And when somebody registers, we send an email — who do we send that email to? You will also want to decide what happens when the user submits — sometimes the form disappears and a “thank you for registering” appears in it’s place, or sometimes the user is redirected to the page where they will ultimately view the broadcast. Sometimes we build a web site specifically for an event or we give an embed code so that you can have the event stream from your page. In either case, it’s important to build these pages in advance because that URL information needs to be in the confirmation email and the reminder email above. Things to include on the viewing page: Chat box? A form for questions? A twitter feed? A link to troubleshoot viewer issues is important because you will be fielding all sorts of questions during the webcast, most of which can be solved by the troubleshoot page. Often overlooked, the stills that play in the viewer when the webcast is not broadcasting. 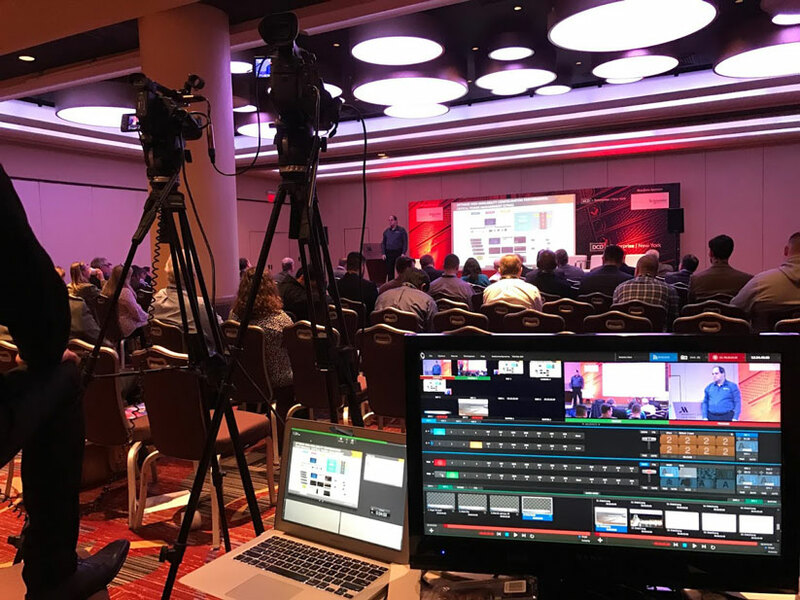 Before the webcast you will want the video viewer to show a still string of some kind, either promoting who will be on camera or the details about when the event starts. You will also probably want some “starting soon” graphics or “returning shortly” graphics for those moments before the event or during intermission. Often overlooked, this is the email that a registrant receives once they have registered. You will want to write the subject line, the body of the email, and also who will be in the “reply-to” field, in case a registrant tries to reply to this email. Registrants will receive a reminder shortly before the webcast starts. You will want to write the subject line and body of that email in advance. And you want to schedule this because it will be the last think you would want to worry about before going live with a webcast. If you want to reach out to us at info@wprny.com to tell us what type of webcast you’re planning, we would love to help you think these details through and support you technically with the production details.